My daughter was walking in the surf near Panama City, Fla., when she got stung. She was barefoot and said something wrapped around her foot right before she felt the pain. One of the lifeguards pulled out a small spine, and she subsequently saw a doctor. He put her on an antibiotic, but the cut on her foot doesn't seem to be healing. What should she do? Most wounds inflicted by stingrays involve the feet and legs, as unwary waders and swimmers tread on the creatures while they are hidden in the sand. A stingray causes injury by lashing upward with a muscular tail-like appendage which carries up to four sharp, sword-like stingers. The stingers are filled with venom, so that the injury inflicted is both a deep puncture or laceration as well as an envenomation. The pain from a stingray wound can be excruciating and accompanied by bleeding, weakness, vomiting, headache, fainting, shortness of breath, paralysis, collapse and occasionally, death. Rinse the wound with whatever clean water is available. Immerse the wound in non-scalding hot water to tolerance (110 to 113 F/43.3 to 45 C) as soon as possible. This may provide some pain relief. Generally, it is necessary to soak the wound for 30 to 90 minutes. Gently extract any obvious piece of stinger. Scrub the wound with soap and water. Do not try to stitch or tape it closed - doing so could promote a serious infection by ‘sealing in’ harmful bacteria. Apply a dressing and seek medical help. If more than 12 hours are likely to pass before a doctor can be reached, start the injured person on an antibiotic (ciprofloxacin, trimethoprim-sulfamethoxazole or doxycycline) to oppose Vibrio bacteria. Administer sufficient and appropriate pain medication. 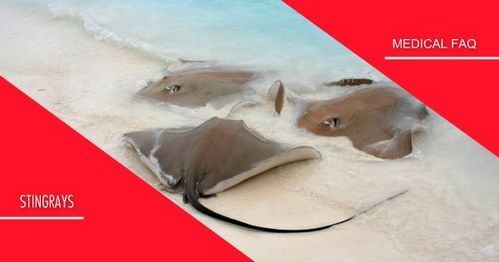 Never handle a stingray unless you know what you are doing or unless the stingrays are definitely familiar with divers and swimmers (e.g., the rays in Stingray City off the Grand Cayman Island in the British West Indies). Even then, respect them for the wild creatures they are - the less you handle them the better for them and for you, too. The reply does not answer the question. I got stung by a stingray while running in the shallow waters in Mexico, but it was a Sunday so didn't go to the Dr, and on Monday we were flying out back to UK. Because I didn't have stitches my foot stayed swollen up for about a month. Only the first four hours were awful pain up the entire leg.